A few years ago, my English friends living in İzmit bought a Kangal puppy. Their children, who had been born and raised here and are pretty much more Turkish than English, gave the puppy the traditional name of Karabaş — Black Head. As a new puppy Karabaş was allowed inside the house. But of course he grew. At about 13 weeks he was bigger than my 13-year-old cocker spaniel. He carried on growing and moved out to the veranda because one wag of his tail would clear the coffee table.He carried on growing and moved out to the large garden because one wag of his tail would clear the table on the veranda. At about 13 months he was bigger than all of the children — even 15-year-old Sarah! Fully grown he is about five centimeters taller than I am, and I have to carry my cocker spaniel past him when we go to visit because, although he just wants to be friends with her, she is terrified of him advancing towards her, and locks her legs at the garden gate refusing to go past the corner of the garden where the giant lives. It is an amazing experience to take a Kangal for a walk. In fact, taking him for a walk is a misnomer. You cannot take a powerful and mighty beast like this out for a stroll on a lead. He needs to run free, and feel the wind in his fur. He needs to smell nature and scramble over rocks and rub his nose against the bark of trees. A few times each day he is allowed out on a very, very long rope and chain to explore the paddock in front of my friends’ house. The chain is needed because, although the Turkish neighbors love and admire him, and are proud of his Turkishness, their young children are scared if he gets too close to them. But, once a day he jumps in the back of the car and is driven up to the hills that cradle the town of İzmit.Here he can run as free as he could in the plains of Anatolia. He leaps and bounds, and when he stretches his legs and races along the path, he can take your breath away! I have never seen a dog so powerful: It is almost as if it is a horse racing past you, not a dog. He could easily mow down anyone who gets in his way. In their new book “The Kangal Dog of Turkey,” Lesley Tahtakılıç and Margaret Mellor celebrate the breed. The Kangal is the famous Turkish shepherd dog who is the closest friend to the lonely shepherd, and the strong guard of his flock. In their magnificently illustrated book Tahtakılıç and Mellor write: “For centuries this dog has played a vital part in the working lives of country people in the Sivas province of central Turkey. The generations have imprinted not only its striking physical characteristics but its unique behavioral qualities. 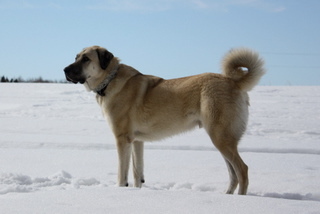 The Kangal Dog (also called the Sivas-Kangal shepherd dog) is valued for its courage and strength, its loyalty to the shepherd, and its devotion to the animals in its charge, a special reputation that has long been appreciated in farming communities within and beyond the provincial borders. When I hear the phrase shepherd dog, I often think of a charming program that was shown in Britain on a Sunday afternoon, just when people were settling down for a snooze in front of the television. “One Man and His Dog” showed sheepdog trials. In beautiful British countryside — often Wales or the Lake District — a shepherd would wait at the foot of a hillside and by using a series of whistled commands, cause his smart dog to round up the sheep, drive them past a number of obstacles and into a pen. The pair who picked up the least faults would win.I would enjoy the idyllic scenery and be amazed at the intelligence and obedience of the dogs. Chosen for their suitability for the task in the English countryside, these would often be border collies or springer spaniels. Transferring the scene to Turkey, you can keep the images of an intelligent and obedient dog, but need to change the image of the scenery. This is no idyllic “One Man and His Dog” beautiful rolling hills, where the only difficulties are those created by the people who put the markers out on the trial course. The rolling Anatolian plain is a vast steppe, with mountains and boulders. It is not well-populated, and settlements can be far away from each other. Instead of lush grass growing in England’s gentle rains, the Anatolian plain has sparse scrub, so flocks often have to travel miles to find sufficient grazing for the sheep. In Anatolia the flocks can be out in all types of weather conditions: from sub-zero temperatures in the winter to the blazing heat of the summer sun. Of course the biggest difference that makes this no picnic is the range of formidable enemies and dangers that face the Anatolian shepherd and his sheep. Finding water can involve a long trek, and perhaps traveling down a very steep slope. Predatory wolves, jackals and eagles are common. Bears and wildcats are less so, but still a possible danger, particularly as many nights the flock sleeps out on the mountains, their quest for pasture and water having led them many miles away from the nearest village. While the British sh eepdog breeds would themselves quite likely fall victims to these predators, the mighty Kangal is ideally suited by its size and temperament to guarding the flock, and the shepherd. They do not work alone — a Turkish version of the program would have to be titled One Man and His Dogs — but in pairs work with other pairs to patrol the area around the flock, barking to signal any danger. In their well-researched book, Tahtakılıç and Mellor trace the history of the breed back to the fifth century B.C. Hittite sculptures show dogs similar to Kangals. I adored the picture of five clay models from the British Museum of dogs, found in a palace in Nineveh. The models have names inscribed on them: “Don’t think, bite!” “Catcher of the enemy,” “Biter of his foe,” “Expeller of evil” and “Loud is his bark.” These show that the Kangal was prized for its protective instinct many millennia ago. But, before I give the impression that these are vicious beasts, I need to emphasize, as the authors do, that the Kangal also has an amazing skill of befriending the sheep in the flock. Perhaps their coloring helps the sheep accept them as one of them, but the Kangal bonds extraordinarily well with the sheep as well as the shepherd. His only aggression is towards those who would attack his close friends. The sheep trust their dogs and, unlike the British scene where they will run away from the dog and towards the direction he is driving them, they will bunch together near their protector. As well as extolling the virtues of this most amazing Turk, the main cry of the authors is how to protect the Kangal as migration to the towns is changing the way of life in the Turkish countryside. They responsibly raise very real concerns about the future, and give some good information on the work of local and international projects to protect this part of Turkey’s heritage. Without the mighty Kangal, the Turkish shepherds may not have been able to rear their sheep. Without their wool and lamb meat, some of the other traditional symbols of Turkey — the carpet or the döner kebap — would not have come into existence. So perhaps the Kangal dog could be called the unique protector of the Turkish way of life? So remember this national treasure next time you admire your carpet! this is a beautiful article as only an Englishman can write it – full of wit and understatement. Ramana.